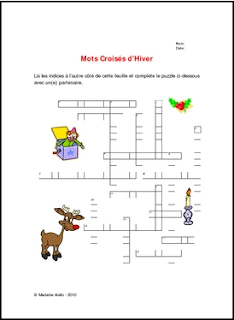 Your students will enjoy this challenging crossword puzzle which reviews winter & Christmas vocabulary they may already know and likely will introduce some new terms as well. Have them work with a partner to use a bilingual dictionary to look up terms as necessary. Crossword spaces include the definite or indefinite article. Now includes two versions of the "crossword clues" page, so that you can use it with students who need the word bank provided to be able to find the answers. If you have any questions, suggestions or concerns, I would be happy to hear from you! Please use the Q&A feature, or request I email you directly to initiate a private discussion. If you found this product useful, please take a moment to rate it!